This property is open for the public to enjoy and appreciate. Before visiting, please review the GBLT Visitor Guidelines for maintaining the environmental integrity of the property. The Spanish River-North Channel Natural Area includes a number of islands situated between Little Current and the Spanish River. This area includes both private and Crown land that is largely in its natural state with the exception of a few seasonal residences. Little information is known about the natural values of the area but it includes representative examples of cobble and sandy coastal wetlands, White Pine – Red Oak forests and both open and shrubbed rock barrens. 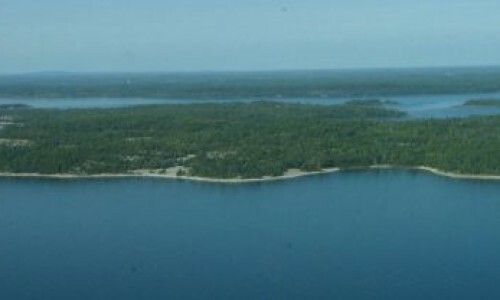 The Campbell property is located on the south shore of Hotham Island and is opposite a large embayment. On Tuesday, August 4th, I had my first extensive visit to the Campbell Reserve on Hotham Island with the Wilkinson family, including David who is one of our stewards. This is the GBLT’s first (and currently only) property in the North Channel and represents the area well. The property is beautiful and I was surprised by the number of Red Pines which apparently are quite common in the North Channel, but are primarily absent from the eastern side of the Bay… maybe because the North Channel has a lot of sandy soils, which is hard to find along the eastern shore. The property includes an extensive wetland along the shore with some great plants including Kalm’s Lobelia. I hope to visit again soon!